Look no further for stylish, comfortable and affordable hotel accommodation in the Toronto area. Each one of our bright and spacious hotel rooms features a host of convenient amenities designed with your comfort in mind. Our extended stay suites offer modern kitchen facilities and plenty of living space for any traveller. Reserve your room or suite online to enjoy contemporary hotel accommodations, convenient hotel amenities and our ideal Etobicoke location at amazingly low nightly rates. Settle down into a comfortable Queen bed in your bright, spacious Single Guest Room. Enjoy modern finishes and convenient amenities including free high speed Wi-Fi, a work desk with an ergonomic chair and desk lamp, a 42” LED flat screen TV with HBO, and a small kitchen station with a mini-fridge, microwave and complimentary coffee/tea. This bright contemporary room features two comfortable Queen beds and all of the convenient amenities you have come to expect: Free high speed Wi-Fi, a work space, a 42” LED flat screen TV with HBO, an eco-friendly toiletries package, and a small kitchen station with a mini-fridge, microwave and complimentary coffee/tea. Be our guest for your extended stay in Toronto and enjoy all the perks of our spacious Kitchenette Suite complete with two Queen beds and a well-equipped kitchen featuring a sink, stovetop oven, dishwasher, sink, full-size fridge and plenty of cupboard space. This suite also features a work space, a 42” LED flat screen TV with HBO, free high speed Wi-Fi and more. Enjoy all the features of our spacious lay out with the added luxury of a soothing Jacuzzi tub for a nice soak at the end of the day. This large suite offers a comfortable King bed, modern finishes, free high speed Wi-Fi, a work space, a 42” LED flat screen TV with HBO and more. 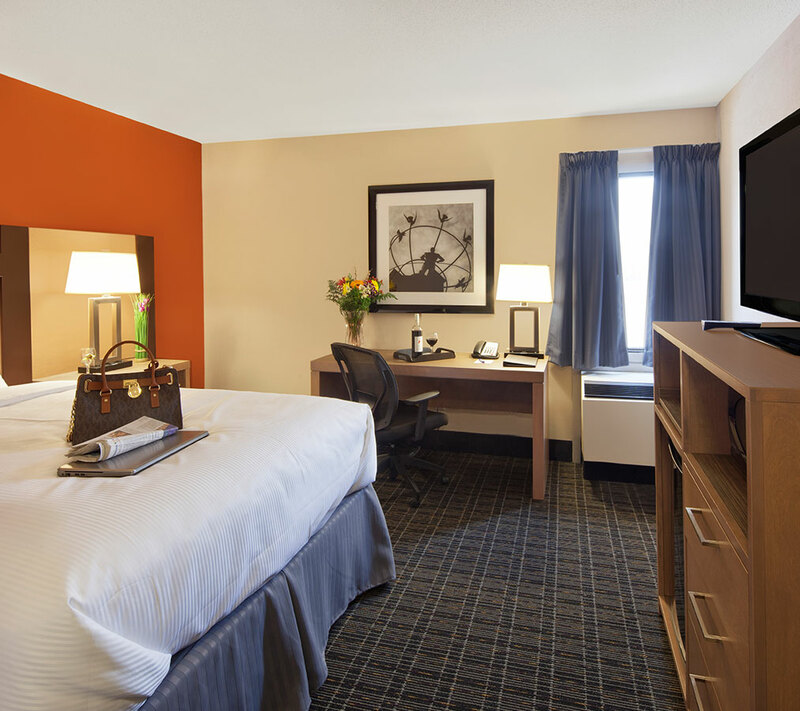 Canadas Best Value Inn Toronto welcomes you to check into your room at 3 p.m. on the day of your scheduled arrival. Check-out time is 11 a.m. on the day of your scheduled departure. We offer smoking and non-smoking accommodations; please specify your needs when booking. Canadas Best Value Inn Toronto does not accommodate pets, except registered Guide Dogs. Reserve your room online today, or contact us for more information about special corporate and group rates and other hotel inquiries.